Intelligence reports indicate conspiracy to kill her in prison. LAHORE, Pakistan (Morning Star News) – Fears are growing over the security of the first Christian woman in Pakistan sentenced to death for “blasphemy” following the execution of Mumtaz Qadri, who assassinated her biggest advocate. 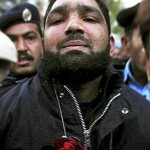 Qadri was executed by hanging on Feb. 29 for the Jan. 4, 2011 assassination of Punjab Gov. Salmaan Taseer, who had criticized Pakistan’s blasphemy laws and advocated for the release of Aasiya Noreen, widely known as Asia Bibi. She has been on death row since she was convicted in 2010 of blaspheming during an argument with a Muslim woman over a bowl of water. ‎A senior Punjab government official confided to Morning Star News that Noreen’s security had been beefed up following intelligence reports that Islamist groups are conspiring to get her killed inside prison to avenge the hanging of Qadri. Taseer had called the country’s controversial blasphemy statute “a black law” and demanded freedom for the Christian mother of two children and stepmother to three others. Speaking on condition of anonymity because he wasn’t authorized to speak to media, the senior government source said that there was already a bounty on Noreen’s head of approximately 50 million rupees (US$$471,000), and that now that Islamist groups were calling for her swift execution, the government was exercising extreme caution to protect her. Islamic extremists feted Qadri, showered with rose petals at his trial, as a hero and martyr, and his funeral last week brought up to 150,000 people into the streets of Rawalpindi, many chanting for Noreen to be hanged. Much prayer is needed for Noreen and other victims of the blasphemy law, he said. Noreen’s lawyer, Saiful Malook, said she is being held in isolation and under strict security. Pakistan has yet to execute anyone convicted of blasphemy, but anyone charged or accused of insulting Islam risks a violent death at the hands of vigilantes. A Christian laborer and his wife were thrown into the furnace of a brick kiln in 2014 after being wrongly accused of throwing pages of the Quran into the garbage. Critics, including European governments, assert the blasphemy laws are misused, with hundreds languishing in jails under false charges that could see them face fines, life imprisonment or death by hanging. Concerns for Noreen’s safety come as a Pakistani Taliban suicide bomber on Monday (March 7) detonated explosives in a courthouse in Charsadda, in Khyber Pakhtunkhwa Province, killing at least 17 people, including policemen and a woman. The Tehreek-e Taliban Pakistan claimed responsibility, saying in a statement that the attack was carried out to “avenge” the execution of Qadri. An alliance of hundreds of lawyers is behind a rise in prosecutions of blasphemy cases in Punjab, according to a recent report. The stated mission of the Khatam-e-Nubuwwat lawyers’ forum and its leader, Ghulam Mustafa Chaudhry, is uncompromising: to use its expertise and influence to ensure that anyone insulting Islam or its prophet, Muhammad, is charged, tried and executed. ‎Since Khatam-e-Nubuwwat was founded 15 years ago, the number of criminal blasphemy cases filed in Punjab, the group’s home base and Pakistan’s most populous province, tripled to 336 by 2014, according to police figures. It fell to 210 in 2015 as stricter provincial rules were applied, but critics said the number was still too high. The same group prosecuted Noreen and later defended Qadri during his trial. The Islamist lawyers are now rallying religious groups to call for Noreen’s execution. Napolean Qayyum, a Christian rights activist, told Morning Star News that he wouldn’t be surprised if the forum’s lawyers storm the Supreme Court during the hearing of Noreen’s appeal against her death sentence. 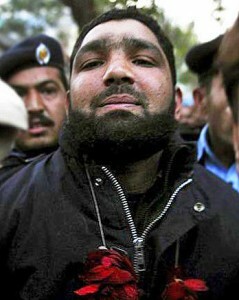 “Fear and intimidation is the extremists’ greatest weapon, and they might use such tactics to intimidate the judges and pressure them into upholding Noreen’s execution,” he said, adding that fears for Noreen’s security inside the prison were well founded as thousands of Qadri’s supporters are baying for her blood to “avenge” their hero’s death.